The Dental Assistant Program will present Program Information sessions during the application period. The sessions will be held on the Decatur Campus, in room 202 of the Health Sciences Building. 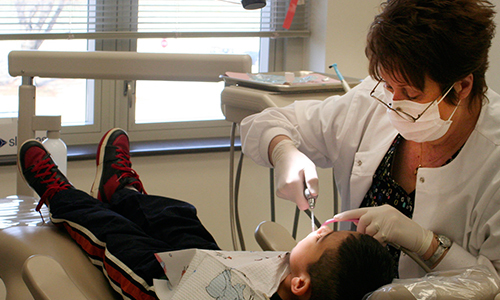 The Dental Assisting Program at Calhoun Community College is designed to develop the student’s cognitive, affective, and psychomotor abilities to assist the dentist in a variety of skills including functioning safely and effectively in the dental operatory, laboratory, and with office management. The skills acquired while in the program will ensure that the student will become a vital member of the dental team. Students enrolled in the dental assisting program may enroll in the certificate program and complete their studies in one year, or a student can earn an Associate of Applied Science degree by completing one year and one semester of study. Each student is also required to take the Certified Dental Assistant (CDA) examination through the Dental Assisting National Board (DANB). The Calhoun Community College program in dental assisting is accredited by the Commission on Dental Accreditation (CODA) and has been granted the accreditation status of approval without reporting requirements. The Commission is a specialized accrediting body recognized by the United States Department of Education. The job market for dental assisting continues to be in an upward growth pattern with over 90% of Calhoun’s program graduates currently employed in the field. Dentists are expected to hire more assistants to perform routine tasks so that they may take on more complex procedures making “Dental Assisting” one of the fastest growing occupations. Use the Alabama Wage Lookup tool on the left to see the average wages for many careers.